There are hundreds of great substitutions for unhealthy foods that make perfect swaps. Surprisingly Greek yogurt has many great uses rather than eating It just for breakfast or a snack. There are various brands of Greek yogurt on the market so let me first explain the type of yogurt you should use for the substitutions that I’ll share with you later in this article. You should ALWAYS avoid Greek yogurts that are flavored or claim to say low fat. The flavored yogurts contain tons of sugar and the low fat yogurts contain artificial sweeteners, which contain harmful chemicals to make the yogurt taste good since the fat has been removed (the fat contains most of the taste). The Greek yogurt that I like to buy at the grocery store is full fat and plain. You can use brands such as Keifer (Product of LifeWay) as well. Keifer is one of my favorites because it’s in smoothie form and it’s easy to use. As mentioned earlier, always choose the plain versions to avoid sugar and harmful chemicals. Try to grab an organic version of yogurt if possible too! One of the condiments that I like to eat with a quesadilla is sour cream. Many people love adding sour cream to foods. The problem with sour cream is that it has a lot of unhealthy fats in it and they don’t sell an organic version of it. If you can’t find an organic sour cream swap it with Greek yogurt. 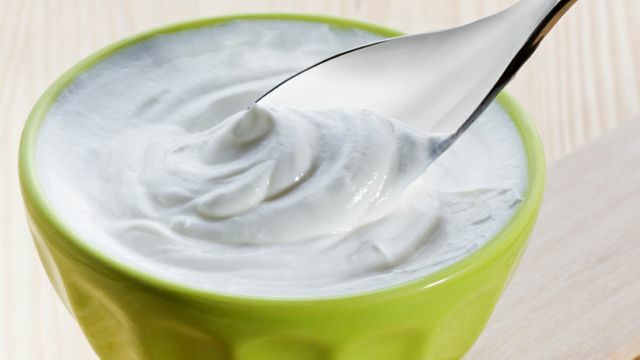 1 cup of sour cream = 1 cup of Greek yogurt. If you don’t have an organic butter to use or you want to use less butter in a recipe then Greek yogurt works great as a butter substitute too! I don’t like to each hordes of butter. I like to add it to foods in moderation. Mayo is another ingredient you can swap with Greek yogurt. If you’re not making homemade mayo then you may want to use Greek yogurt since it’s healthier than grocery store bought mayonnaise. Avoid the soybean and canola oils and go Greek. If you’re not using an organic heavy cream or you want to try something new then Greek yogurt can be a great substitute. Just like butter I like to have cream in moderation. Too much of anything can take a toll on your health. I’ve also substituted milk in some recipes with Greek yogurt and it has tasted great! I highly recommend you try these swaps if you don’t have organic ingredients. This can easily help you be healthier, live longer, and feel full of energy!